Coimbatore is the third largest city in Tamilnadu where the climate is comfortable throughout the year. There are more than 30,000 tiny small, medium and large scale industries and textile mills. The city is situated on the banks of the river Noyyal.The development of hydroelectricity from the Pykara falls in the 1930's ed to cotton boom in Coimbatore.The result has been a strong economy and a reputation as one of the greatest industrial cities in South India. 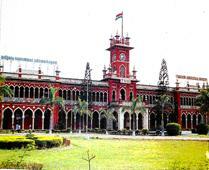 Coimbatore is situated in the extreme west of Tamil Nadu, near the state of Kerala. It is surrounded by mountains on the west, with reserve forests and the (Nilgiri Biosphere Reserve) on the northern side. The eastern side of the district, including the city is predominantly dry. The entire western and northern part of the district borders the Western Ghats with the Nilgiri biosphere as well as the Anaimalai and Munnar ranges. A western pass to Kerala, popularly referred to as the Palghat Gap provides its boundary. Because of its close proximity to the Western Ghats, the district is rich in fauna. Coimbatore existed even prior to the 2nd century AD as a small tribal village capital Kongunad untills it was brought under Chola control in the 2nd or 3rd century AD by Karikalan, the first of the early Cholas. When Kongunad fell to the British along with the rest of the state, its name was changed to Coimbatre and it is by this name it is known today, except in Tamil, in which it is called as Kovai.It is also known as "Manchester of South India" or the Cotton City. Mariamman Festival - The Mariamman festivals, at the city’s numerous Amman temples, is a major event in summer. This is one of the most popular festivals celebrated along with Koniamman temple car festival. Car Festivals- Car festivals at the Karamadai temple and the famous Avinashi temple attract a large attendance. Traditional Hindu festivals like Pongal, Deepavali are major events. Ayudha pooja is an important festival. All commercial establishments are cleaned, painted, machines and vehicles washed, concluding with a pooja. Other religious occasions like Ramzan and Christmas are also observed by the city. One of the best institutions of its kind in South Asia. Its location was originally in Chennai which was later moved to Coimbatore in 1907.
the presiding deity who was the son of Lord Shiva.Marythamalai Sri Murugan got its name from the marutha trees on the hill. The temple is located in Perur, 6 km from Coimbatore on the Siruvani main road, on the banks of the Noyyal river. This temple is dedicated to Lord Shiva with a Swayambumoorthy. This is one of the oldest temples in Coimbatore and is located at 10 kms from Coimbatore on Pollachi road. The temple is dedicated to Lord Vinayagar.The dietys height is 6 feet and the width is 3 feet and is one of the biggest in South India. It is on the banks of the Bhavani River in Mettupalayam. 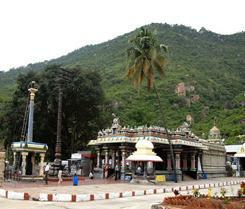 The goddess' name is "Vanabhadra Kaliamman".This temple attracts large crowds and also it is a very good picnic spot. Infant Jesus Church - This is a famous church situated in Kovi Pudur.Devotees throng the Church on thursdays for attending the Novena. Hidayathul Islam Safia Jamath - This mosque s located 1km away from the railway station and is known for its architectural structures. This was the first mosque to be built in Coimbatore. This is a waterfall at Siruvani which is 37km from Coimbatore and is quiet magnificent.Kovai Kutralam is amidst a thick forest and so not allowed after 5 pm. 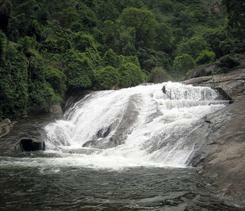 This Waterfalls and the Dam are about an hour's drive from Coimbatore. The water of Siruvani is known for its taste. The panoramic views of the dam and the falls are enchanting. This temple situated at Vellingiri foothills about 30kms from Coimbatore is very much a part of this glorious tradition. Dhyanalinga was consecrated by Sadhguru Jaggi, Vasudev, a realized Master, Mystic and Yogi, after three years of intense process of prana prathista. 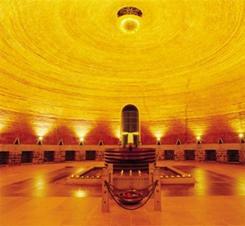 Measuring 13' 9'', Dhyanalingam is the largest mercury based live Linga in the world. This sanctuary is situated at an altitude of 1,400 metres in the Western Ghats near Pollachi. The area of the sanctuary is 958 Sq.Kms. It has various kinds of exotic fauna like elephant, gaur, tiger, panther, sloth bear, pangolin, black headed oriole, green pigeon and civet cat. 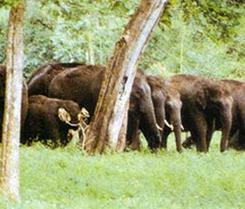 It is about 90 Kms from Coimbatore.There are bungalows available within the sanctuary. 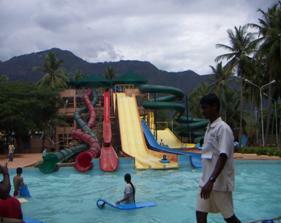 This is situated 41km from Coimbatore and is Asia's no.1 water theme park amidst the cooling shelter of trees. The park offers exciting moments of adventure and fun while you are with your family and friends. This park is named after the freedom fighter V.O.Cidambaram and is maintained by the Corporation. There is a mini zoo and a joy train in the park. Phone: 2232012, 2232013, 2232014, 2232016. Coimbatore - 641 018, Tamil Nadu, India. 1. Big Bazaar Street and Oppanakara Street - textiles How To Reach This Bazaar? 3. Sukravarpettai - (Handloom Sarees). 5. Cross-cut Road, Gandhi puram.How To Reach This Bazaar? 6. D.B. Road, R.S. puram. The airport is about 11 kms away from the central town area catering domestic flights to Bangalore, Mumbai, Chennai, Kochi and Madurai and international flights to Singapore, Kuala Lumpur, Dubai, Muscat, Sharjah and Colombo. Coimbatore is one of the major railway junctions of the southern railways connecting major cities like Chennai, Madurai,Bangalore, Mumbai, Kochi, Rameshwaram and Delhi. Gandhipuram Bus Stand - Buses to Erode, Tirupur, Mettupalayam, Ooty, Salem, Bangalore, Chennai and other distant places are available here. Singanallur Bus Stand - Buses to Madurai, Trichirapalli, Thanjavur, Kumbakonam and nearby towns are available here. Ukkadam Bus Stand - Buses to Palakkad, Pollachi, Palani, Dindigul, Kodaikanal and other nearby places are available here.